Fast forward 25 years -- sometimes you need many years to put things in perspective -- the once sinking Pound Sterling recently hit a high of 2 US Dollars. 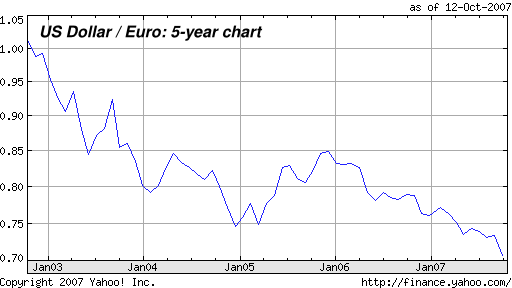 From a low of about 83 US cents per one Euro in October 2000, the Euro is up over 70% vs the dollar. You now need only 0.70 Euros to buy one Dollar. Yet, the Dollar keeps falling. Many people are worried about the Dollar. I took a page from Dr Strangelove, seriously. Not that it is much fun. I remember how cheap was our 2002 trip to the Canadian Rockies, when one US Dollar used to buy 1.6 Canadian dollars. They are now on par, oops, the US Dollar is a bit lower already. Why is the US dollar so weak? There are several reasons. For starters there's too many US Dollars in hands that don't need more of it. Trade gaps cause countries like China and Oil exporting countries to have hundreds of billions of dollars in surplus, and the US continuing trade deficit makes this balance unlikely to change soon. More Dollars need to be printed, which keep its value down. At the same time, Oil (which is a proxy to the dollar sinking, because it is denominated in dollars) keeps rising. When the media flashes headlines like "Oil hits new high" ask yourself is it really oil hitting new highs or rather the U.S. Dollar hitting new lows. To add insult to injury, the US government keeps spending like there's no tomorrow. Government debt, money printing, and issuing of US treasury bonds are all at all time highs. And then, there's the lowering of interest rates which makes the Dollar even less attractive. So will the Dollar keep sinking? Probably. A long term recovery of the Dollar is very unlikely against a backdrop of record trade deficit, record government debt, excessive money printing, and interest rate reductions. Will the Dollar sink another almost unthinkable 25%, or 30% against the Euro on top of the over 70% it already went through since 2000? When will the inevitable reversion to the mean finally start taking place? I don't really know, and fortunately, I don't need to know. Betting on currencies relative direction is not something I feel confident about. But don't despair, there's a simpler way to survive this. Read on. My view is that much the smart money, except huge holders like China which cannot possibly move fast, is already diversified. This includes oil exporters buying Euros, and investors like you and me shifting a significant proportion of their portfolios to non-US assets for a long time now. The large Dollar surplus of countries like China means that at a certain point Chinese entities will start buying assets in the US just like the Japanese did in the 1980's. They could buy real estate, or whole companies. Remember Lenovo buying IBM's PC business? Multiply this deal many times over. This looks like the most sensible way to deploy all these surplus dollars back into the continent without causing too much of a world-wide monetary shock. We should also realize that part of the great appreciation in the markets is a reflection of the fact that each dollar is worth less, and that big multinational companies which sell their goods globally, are doing just fine, thank you. 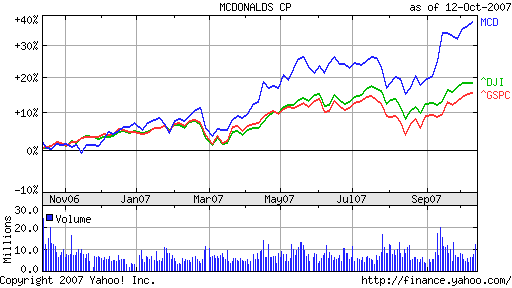 See this chart on the right, of McDonald's vs the S&P500 and the DJI in the past year. So what would Dr Strangelove do? Simple. Rather than bet of currency directions, he would buy real companies which are healthy and growing and are trading at good valuations, Dollars or not. This means that for example, he would avoid China whose ETF, FXI, trades at a outlandish PE exceeding 29. He would invest in US multinationals whose income comes in large part from outside the US. Those companies which weaker exchange rates actually boost their bottom line. Rather than feel depressed about gas prices, he would buy ETFs like IXC or DKA (international energy). Now, every time he pays $15 dollars more for gas, he would smile knowing how much more than that extra few dollars, his portfolio has gained at the same time. He wouldn't confuse intermediate -- and often sharp -- dollar rallies with a new trend. 2005 was a very strong year for the dollar (see chart above) but even the year-long rally eventually fizzled and the Dollar is now lower that it was in December 2004. Expect more counter movements. He would hum Paul McCartney's "The Pound is Sinking" for perspective. He would think "Wernher von Braun." What goes up must come down. There's nothing he can do to change this trend anyway, so he would just flow with the trend, do what makes sense, and take it easy. No less than 6 different energy ETFs rank among the top 40. The average market capitalization of the top 40 ETFs is slightly over 38 Billion dollars. The best ETFs according to this simple model, are overwhelmingly large-cap right now. There's a strong representation of international and multi-national companies in the top 40. The valuations among the top 40 are low with very few exceptions. The simple average PE of all the top 40 is just below 14 with a 1/3rd of them in the 10-13 PE range. Which brings us back full circle to the current ETF rankings. In this Friday's ETF rankings, the dominant themes remain: Large-cap international and multi-national stocks, Oil & Energy, Telecoms, Materials, and a few, select reasonably-valued countries from Asia and Europe. Spain: the real-estate bubble there may be very similar to the US, and close to popping, so I would avoid it for now. Also: even though we had a down week with a very bad Friday, the markets are way over-extended at this point. The past 2 month rally has been extreme. I would sit on my cash and wait for a much deeper correction before committing anything even to these top 40 ETFs. I would still avoid a few which rank. In particular, Utilities, Aerospace & Defense, and Environmental Services, which are a bit too high on the valuation scale, even though their momentum looks great. Remember, momentum can cut both ways. Never buy overvalued assets. And that's about it for this October. I hope to write again sometime in November. As always, any feedback, question, request, criticism etc. is very welcome.